FANBOY PLANET.com . : cg-forrestackerman :. You’ve been to Comic-Con and you totally remember the thousands of people wearing costumes. That’s because of a guy named Forrest J. Ackerman who everyone called Forry. He wore a Space Patrol costume to the first World’s Science Fiction Convention, the first time anyone had ever worn a costume at a con. It was made by his girlfriend, Myrtle Roberta Johnson, who everyone called MoRoJo. Somehow, the whole thing of costuming at conventions took off. Forry Ackerman has probably influenced more significant figures in the history of science fiction and fantasy than anyone other than Asimov and Heinlein. He was friends with Ray Bradbury and Ray Harryhausen and both have cited him as an influence (and I believe he published Bradbury’s first story in one of his fanzines). He was an agent for years and gave major boosts to the career of Marion Zimmer Bradley. He even represented L. Ron Hubbard back when he was only a hack adventure writer. He also influenced a generation of film fans with his magazine Famous Monsters of Filmland, which gave praise to those working behind the scenes. Everyone from Steven Spielberg to Stephen King have said that he was a major influence. Peter Jackson was such a fan that he had Forry do a cameo in Dead Alive. Both Joe Dante and John Landis had him appear in several of their films. He even showed up in the Double-D Avenger, which I’m sure has turned at least one person into something special. Forry was a science fiction fan from the beginning of SF Fandom. He was one of many who wrote to the science fiction magazines of the day. With each letter, they’d publish the address of the sender and he was the first to write a letter directly to another writer and that helped give rise to modern fandom. He wrote several fanzines and was one of the founding members of the Las Angeles Science Fantasy Society, which still exists today. He even loaned Ray Bradbury the money so he could travel from LA to New York for the first WorldCon. For decades, Forry had a mansion in Los Feliz called the Ackermansion. He threw many legendary parties. One of those parties saw BJo Trimble meet her future husband John under the piano. He threw a famous weekend-long birthday party for years. Forry’s mansion held a collection so wonderful that he would allow just about anyone to come and take a tour. That tour represented the only science fiction museum in the world at the time, and when an actual science fiction museum opened up in Seattle, he was on the Board. 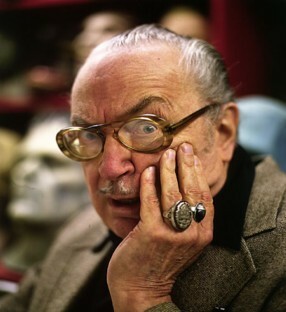 His collection included several of the animals used in King Kong (which Peter Jackson scanned to help created his monsters for his version), the ring Bela Lugosi wore in Dracula, a False Maria (from Fritz Lang's Metropolis -- editor) and too many more marvels to list. And there’s no much more. He translated and published many Perry Rhodan novels in the US. He was a firm believer in Esperanto and once walked down the street with Leo G. Carrol singing the anthem of the language. He won the #1 Fan Personality Hugo in 1953. He was a tireless lover of films, and a writer of stories. He was a man who would crack a pun at the drop of a hat, and probably have another ready for when it hit the ground. If you ever wanted to get an idea about what it’s like to be a legend, read his articles here. Personally, I’m crushed. He was one of the Five Old Men, the guys I’ve always admired for their zines and writing. Harry Warner Jr. was the first of them to pass; they’re all in the 70s, 80s or 90s now, and Forry was the second. There’s a photo of a 9 month old me with my Dad and Forry at NASFiC in 1975. The tour of the Ackermansion I took with Forry and my family in 1984 was what got me thinking that being around museums was a wonderful thing and when I last talked to him face-to-face in 2006, I thanked him for it. He knew my name, probably because he had been talking with a bunch of my pals right before I came over. “I hear you’re going to be me in fifty years.” Forry said. “Well, it’s more like 60, really.” I answered. Forry Ackerman will be missed. He was 92.